For the best protection against corrosive atmospheres, dust and water, our special Wet Location series of Exit Signs protects you, even in the worst conditions where water spray, splashing and hose downs ofter occur. • A special polycarbonate housing protects against the worst elements. • 25-year LED lights require less than 3 watts of energy! 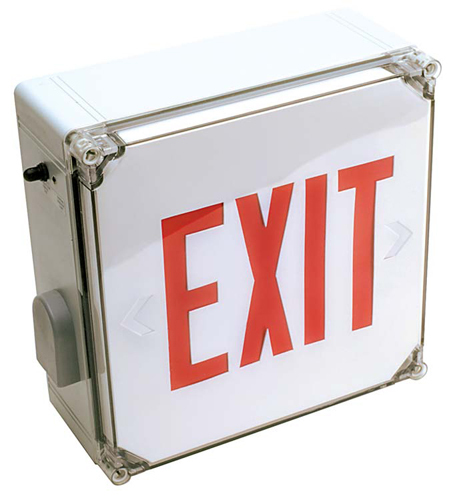 • Lamps add 6.5" to the height of this exit sign. • Exit sign comes standard with an AC power source. A Nickel-Cadmium Battery Backup option is available at an additional cost. • Exit light is provided with one face and snap-in directional arrows.